Click here for 6 full quotes from Kamala Harris in the book The Truths We Hold, by Kamala Harris. This book is Kamala Harris' introduction of herself to voters, accompanying her announcement for the presidency early in 2019. Harris outlines her views on domestic issues at length, but foreign policy issues only sparingly (presumably there'll be a big foreign policy speech sometime later in the 2020 campaign, and perhaps another book). 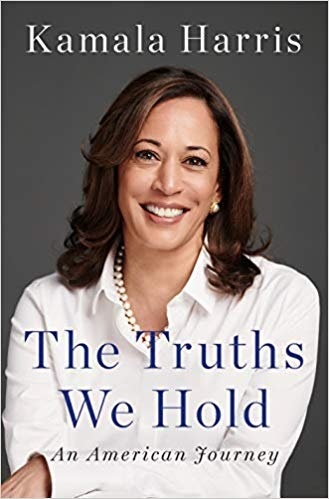 We will discuss here whether the book substantiates Kamala's campaign slogan, "For the People" -- that's the title of chapter one of this book, and the slogan that appears as the title tag of her campaign website. The slogan is what Kamala said in court countless times, as the public prosecutor, when identifying herself in a case in which she represented the state of California (as in "John Smith for the defendant" vs. "Kamala Harris, for the people" which really means "for the state"). But it also has populist overtones, as in "I am for the people against big business". This book well-exemplifies Harris' populist credentials, but not her progressive credentials. Our VoteMatch rating of Kamala Harris scores her as a "Populist-Leaning Liberal", which this book substantiates. Every one of the frontrunner candidates has some anti-progressive stances; and every major issue includes some Demcoratic candidates who aren't progressive. We note that Joe Biden and some others never call themselves progressives -- but Kamala Harris does. And we omit several issues on which all of the candidates agree -- such as: pro-ObamaCare; pro-immigration; anti-voter suppression; pro-green energy; pro-federal stimulus -- those are President Trump's and the Republican Party's big issues so the Democrats are all consistent. (You can click on the candidates' names to see the issue stance lists on which we based our summary). Bottom line: Kamala Harris is a pretty good progressive, not the most progressive among the Demcoratic frontrunners, but not the worst. For progressive voters whose key issue is criminal justice reform, Harris is unacceptably non-progressive, as we explore in our book review of Smart on Crime. Similarly, for progressive voters whose key issue is public education, Cory Booker is unacceptably non-progressive -- but he is a pretty good progressive on other issues. Democratic progressive voters should define their own core issue and supprt a candidate who matches their priorities -- there are plenty to choose from in 2020! I'm part of changing prosecutors' history of injustice. Back on Track: expungement for first-time minor offenders. Punish violent criminals, but understand they also need help. As child, bused to desegregated school with mixed races. Sanctuary for prostituted youth so they can escape pimps. Shut down brothels masquerading as massage parlors.